Highest quality laser cutting technology and weldments. Cannon offers both advanced laser cutting and welding services. Cannon Industries utilizes only the highest quality laser cutting technology in the industry. Not only can we laser cut your sheet metal work, we can handle your weldments as well. Our Mazak STX 4000 watt laser cutting table gives Cannon the ability to steel that is more than ½″ in thickness. The 5′x10′ load/unload capability can burn through .750-inch mild steel, .5-inch stainless steel, or .375-inch aluminum. 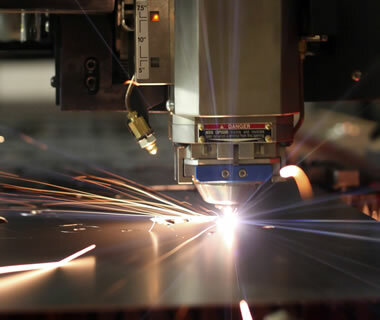 Cannon’s Laser Cutting Technology can burn any shape into thick or thin steel or aluminum for use in heavy industrial applications or large machinery. In addition to cutting, Cannon can bend thick steel and weld it to fit your most rugged applications. With the acquisition of the Mazak STX 4000, Cannon Industries has made a significant commitment to the weldment fabrication industry. Cannon is now a major player in the production of thick steel parts for large industrial machines, heavy industry, and any other area requiring the strongest most robust components.